If an organization wishes to take taxpayer money, they should not discriminate against the very taxpayers who are helping to fund that organization. Take Newt Gingrich (please), who argued on CNN this morning, that religious adoption services should have the right to turn away gay couples wishing to adopt, in states where it is legal for them to do so. He argues that these religious adoption services, such as the Catholic Church, have "been forced to close," when, in reality, they closed up shop rather than follow the laws required of them. 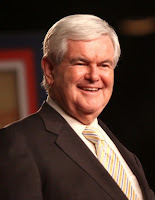 GINGRICH: Because you’re saying to religious group, give up your religion. That’s absurd. The idea that the state would impose its secular values on a religious organization is an absurdity. O’BRIEN: If you want funding. Isn’t that if you want funding. GINGRICH: No. No. In Massachusetts. O’BRIEN: You can do whatever you want but if you want funding. GINGRICH: No, that’s not true. That’s not true. There are states now, including the District of Columbia, which essentially adopt laws that say you can’t offer an adoption service unless you meet the secular standards of the state. They are in effect saying the secular standards of the state are more important than religious freedom. I think it is inherently anti-Christian and anti-Jewish. It is in favor of a secular model, that I think is wrong. And I think that it’s wrong for the government to impose its values on religion. That’s the whole point of the First Amendment, is to not have the government imposing values on religion. Your page is so wonderful! You certain do know how to retain your audience entertained. Im so glad that i took the time to appear at this weblog, due to the fact let me inform you. Not a good deal of individuals know how you can balance understanding of the subject and content. The video is excellent!